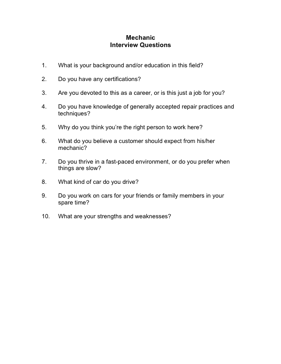 Choose your next Mechanic with the aid of these helpful interview questions. 1. What is your background and/or education in this field? 2. Do you have any certifications? 3. Are you devoted to this as a career, or is this just a job for you? 4. Do you have knowledge of generally accepted repair practices and techniques? 5. Why do you think you're the right person to work here? 6. What do you believe a customer should expect from his/her mechanic? 7. Do you thrive in a fast-paced environment, or do you prefer when things are slow? 8. What kind of car do you drive? 9. Do you work on cars for your friends or family members in your spare time?